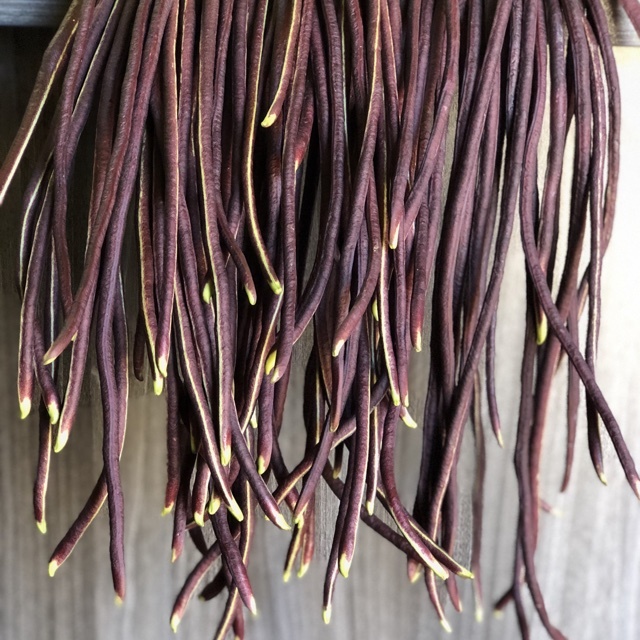 China Long Purple beans have long bean pods that can reach up to thirty inches in length, hence the moniker “yard-long” bean. For best flavor and texture though the beans are best when harvested between twelve and eighteen inches long, before the seeds within the pods are fully mature. The pods have a cylindrical form and have a slightly grooved, deep purple colored skin. When picked young and shorter in length, they will be tender enough to be eaten raw. The longer beans are best when cooked. The cowpea relative is chewier than most other long beans, but is still crisp; you can snap them with your hands. They have a slightly sweet, green bean flavor and are similar in taste to the China long green beans only with a stronger flavor. China Long Purple beans are available year-round with a peak season in the late summer and fall months. China Long Purple beans, botanically known as part of Vigna unguiculata subsp. sesquipedalis, are a member of the Fabaceae family and a type of cowpea. 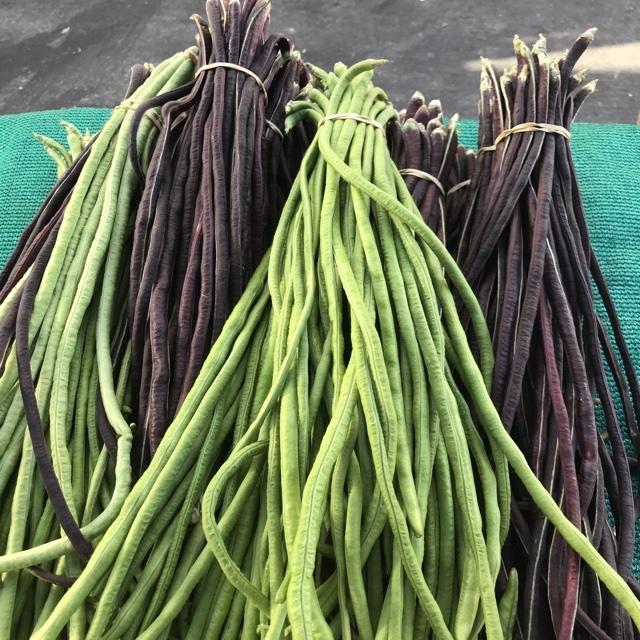 Otherwise known as Purple-Podded Asparagus bean, Purple Snake bean, and Yard Long bean, the China Long Purple beans contain anthocyanin, a phytochemical that gives the yard-long beans their rich purple color. In addition to the purple variety, there are also pure green and yellow varieties as well as multicolored beans in varying hues of pink, purple and green. China Long Purple beans are rich in vitamin A, vitamin C, protein, fiber, folate, magnesium, thiamin, potassium, and iron. China Long Purple beans can be used much like China long green beans. When young the beans are tender enough that they can be used raw. 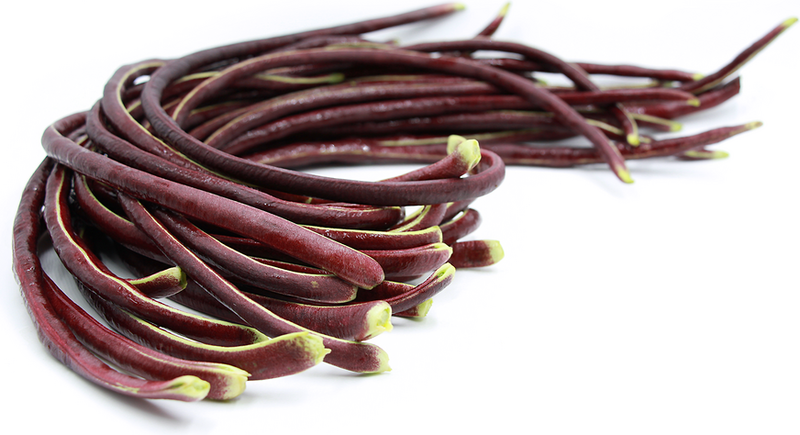 Mature China Long Purple beans are best when grilled, dry-fried, sautéed or stir-fried. Cooking in water for too long has a tendency to water log the beans and impart an undesirable texture so care should be taken when boiling or steaming only to do so for a very short period. Additionally the beans can be pickled, a preparation popular in Chinese cuisine. Unlike many other purple beans China Long Purple beans will hold their color well when cooked. Complimentary ingredients include garlic, ginger, black pepper, onion, Thai basil, cumin, soy sauce, miso, oyster sauce, Sichuan peppercorns, black bean sauce, toasted sesame oil, butter, ground pork, beef, and poultry. To store keep China Long Purple beans refrigerated and use within four to five days or before the beans become limp, wilted and droopy. China Long Purple beans are native to southern Asia and are predominant in Thai, Chinese and Filipino cuisines. Today China Long beans can be grown year-round in Mexico, California and the Caribbean. Fairly easy to grow China Long Purple beans are a warm season crop and will do well even in areas prone to drought. A vining legume, plants should be trellised or provided beams for support. China Long Purple bean plants produce two bean pods per flower and will develop pods after sixty days of cultivation. Recipes that include China Long Purple Beans. One is easiest, three is harder. People have shared China Long Purple Beans using the Specialty Produce app for iPhone and Android. Sharer's comments : Purple China Long Beans spotted at Little Italy Mercato. Sharer's comments : Purple China Long Beans spotted at Specialty Produce.